Jay Cutler has been on the market since the Chicago Bears released him in back in March, but he’s found a new home: the broadcast booth. Like Tony Romo, he’s pursuing a career in television. FOX Sports announced Friday that they have hired the 34-year-old to join Kevin Burkhardt and Charles Davis in the booth this season. NEWS. It's official. Jay Cutler has been hired by @nflonfox . Will join Kevin Burkhardt and Charles Davis in the booth this season. Cutler released a statement on Friday regarding his playing career and next move. I don’t know if retirement is the right word; I don’t feel that anyone ever really retires from the NFL. You are either forced to leave, or you lose the desire to do what’s required to keep going. I’m in between those situations at this point in my life. Words can’t express how grateful I am to everyone who helped me along my journey. I started playing tackle football at the age of 10 and was so lucky to have supportive parents and great coaches along the way that made my path possible. If I listed each person individually, this would quickly turn into an essay, but you know who you are and I wouldn’t be in this situation without you. So thank you. To my parents, my sisters, my wife and kids–thank you for putting your wants and needs on the back burner while I played a game very Friday, Saturday or Sunday. You made it all possible. Thank you to everyone along the way. You made my dream come true. The veteran quarterback had conversations with the Jets and Texans as potential landing spots, but nothing ever came of it. Age and durability were presumably the primary factors for the lack of interest in Cutler during the free-agency period. 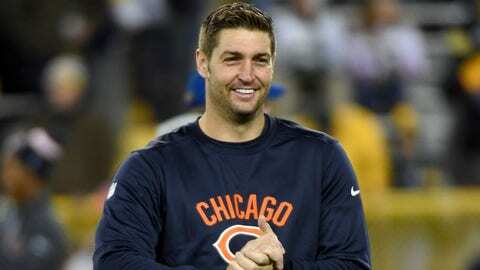 His agent said previously that Cutler wasn’t considering retirement and planned to play this season. Cutler was a first-round pick in 2006, spending time with both the Broncos and Bears. He has 208 touchdown passes in his career and owns a record of 68-71 in 139 career games.